All fish produce ammonia as a biological waste. While bettas can tolerate it better than most fish, ammonia is still poisonous to them, and needs to be controlled. You can take a number of steps to reduce the ammonia in a betta's aquarium and improve his health. Ammonia harms fish like bettas by burning their gills. Fish afflicted by ammonia poisoning tend to gasp at the water's surface. While taking the occasional breath of surface air is a normal part of a betta's behavior, one afflicted with ammonia poisoning will do so in a more frantic manner. Bettas poisoned by ammonia may also swim in darting movements. Ammonia—and a related nitrogen compound called nitrite—can harm bettas and cause them to display these symptoms in any detectable amount. If you do not address the underlying cause of excessive ammonia, any measure you take will be, at best, a stopgap. Many people keep bettas in small bowls. However, bettas in real aquariums with filters and heaters tend to live much longer than bettas in bowls. Part of this has to do with ammonia. In a small, overcrowded bowl, bettas can find themselves facing dangerous levels of ammonia. Overfeeding a betta is one of the things that can produce ammonia. 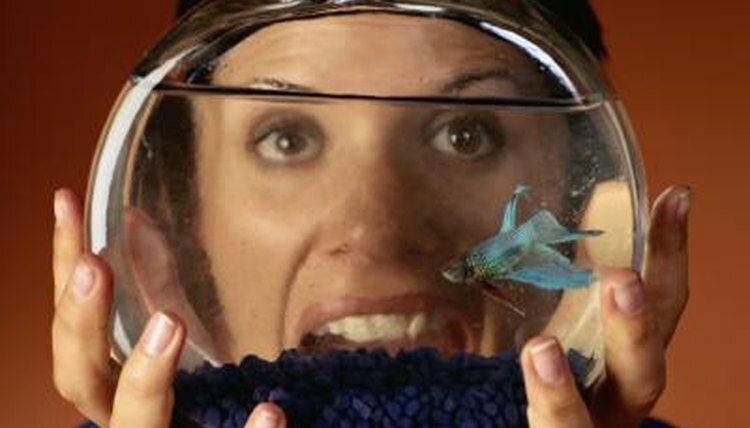 In a small bowl, the ammonia is less diluted and more dangerous to the fish. So to best address ammonia, keep bettas in a real aquarium and do not overfeed them. Water changes directly address the problem of excessive ammonia by removing some of the ammonia and diluting whatever is left. However, when you replace aquarium water, make sure you dechlorinate it first with aquarium dechlorinator. Always make certain the dechlorinator can also deal with chloramine, since some tap water contains a chlorine compound that can release ammonia when it reacts with dechlorinator. Any dechlorinator that can break down or bind up chloramine can address this problem. If you have detectable levels of ammonia or nitrite, or your betta displays the symptoms of ammonia poisoning, stop feeding while you address the source of the problem. A betta can skip food for a few days without harm. A fish with less food produces less waste, and less new ammonia. This gives the aquarium time to build up colonies of bacteria that break down ammonia. Once ammonia levels reach zero, you can start to feed again. How Does Chlorination Affect Marine Life? What Can Be Used to Clean Goldfish Gravel?